We recently highlighted (EuroTelcoblog No. 40, 14th May) the "ISDN-buster" product from Cablecom (100kbps cable modem with IP telephony bundled, launched mid-April), and we understand that demand for this product, even with minimal promotion, is currently running at more than double the company's initial expectations. Early in the month we saw orders from Telenet in Belgium for IP telephony kit from Nortel and Arris, and also press reporting that Telenet is to launch an MVNO as part of its bundling strategy. Dutch cablecos UPC and Essent are both advanced with VoIP deployments, with UPC's parent UnitedGlobalCom announcing at its Q1 results on 10th May that it is moving forward the commercial launch date to late summer 2004. We think UPC's franchise in Austria may also be in a strong position to move in this direction as well. France is a more difficult call given the historically weak market position of cable in broadband, and the arrival of the IP Triple Play over ADSL. However, it is interesting to see Liberty Media now controlling assets in the French market, even moreso in light of the deal announced last week between Liberty's Puerto Rico subsidiary and Net2Phone. In this transaction, Net2Phone is to supply a hosted IP telephony service for Liberty's entire footprint (310k homes passed, 120k subs) for a minimum of six years. We can only speculate as to what, if any, strategic relationship this agreement has to Liberty's market positioning in France, but we suspect there is more to come. As for the UK market, we have never expected NTL and Telewest to jump on the VoIP bandwagon, given the success of their switched telephony businesses. However, it was interesting to see reporting earlier this week in The Register (http://www.theregister.co.uk/2004/05/25/ntl_adsl/), claiming that journalists have seen company documents outlining plans for NTL's impending entry into the ADSL market as a strategy for footprint expansion. This is something we have been expecting for some time, but the really interesting question is whether NTL will seek to leverage its existing TV programming on an ADSL platform, and what implications such a move might have for BT Group's own plans for video. One of our sources in the field has reported that at the VON Canada show on Tuesday, Skype co-founder Niklas Zennstrom publicly announced the launch of SkypeOut, a service which allows Skype users to place calls to the PSTN. We heard about this concept from the company some time back, and have received a test call using the solution, which sounded indistinguishable from a normal PSTN call. There doesn't seem to have been much reporting of this yet as far as we can see besides this article from the Mercury News (http://www.mercurynews.com/mld/mercurynews/business/8701585.htm), but it might serve as a wakeup call to some within the industry who have been dismissive of the service as a closed community (and of closed VoIP systems generally). Details are sketchy at present, but our original impression was that the service would involve a pre-paid system, and we expect this may still be the case. Apparently Skype has signed agreements with two as-yet unnamed telco partners to begin terminating on the PSTN from this summer, and there is also reportedly a subscription service in the works which will allow users to have a geographical number and to receive incoming calls from the PSTN. More as the story emerges. BT today confirmed recent media speculation and unveiled an MVNO agreement with Vodafone in the UK for the introduction of the long-awaited Bluephone product, originally expected by April (http://www.btplc.com/Innovation/Mobility/everywhere/) and held a webcast press event at BT Centre (http://www.btplc.com/News/Presentations/Industryanalystspresentations/Mobility180504.htm). Bluephone is a converged fixed/mobile product which effectively extends the fixed phone subscription into the WAN using GSM. Conversely, it might be viewed as a GSM product which employs Bluetooth to make calls over the fixed network when in range of a Bluephone access point (AP). The service has passed through trials with 50 users over the past two months, and a 1,000-user softlaunch will follow later in the summer with commercial launch late in the year. BT will continue to honor contractual MVNO agreements with both T-Mobile and O2, but will begin migrating customers to the new service after launch. The service uses a protocol developed by Ericsson called UMA (unlicensed mobile access), which allows GSM/GPRS features to function on other bearer technologies. The first handset will be a Motorola V-series with a Class 1 Bluetooth chip embedded in it, and will reportedly be identical in form factor and price to its pure GSM counterparts. Effective range indoors is estimated at 20 - 25 meters, and so is comparable to DECT coverage. Voice quality is said to be superior to GSM. BT claims to have seen very strong interest from other Tier 1 handset suppliers, so no doubt more is in the pipeline in this category. We understand that Motorola is in development with a version also including Wi-Fi. BT has also established a Convergence Alliance, whose other charter members are Korea Telecom and Brasil Telecom. BT has long talked about the high proportion (30%) of mobile phone calls made from within the home, and previous OFTEL surveys into mobile usage showed a strong propensity for teenagers to make mobile calls from within the home due to privacy issues or the fixed line being unavailable at the time. This is BT's initiative to claw back some of that usage, albeit at a lower price point. Bluephone access points can handle four concurrent calls, which we think will probably appeal to families where there may be competition for the phone line, or where parents may be concerned at the mobile bills being racked up by their kids. Additionally, within the enterprise there would appear to be a clear savings to be had from effectively reclassifying GSM traffic as internal calls. Within our own organization it is common for members of the IT department and other quasi-nomadic staff to make in-building calls via our commercial supplier's GSM network in order to find their colleagues out on support calls. The Bluephone concept should prove an attractive one from this perspective. The other really interesting angle on this is the potential to capture usage which would normally be entirely lost to the mobile networks in a WAN environment. As we understand it, the Bluephone handset will always give priority to a Bluephone AP (even mid-call, via seamless handover), and can register on any Bluephone AP. As the subscriber authentication resides in the SIM card, there are no issues related to billing when effectively using another person's AP (or "phone line"). In this sense, a Bluephone AP could be likened conceptually to a public Wi-Fi hotspot, offering a price arbitrage opportunity for the GSM subscriber in places like coffee shops and stores, which we think would be a very attractive selling point for BT. On the downside, with each AP reportedly only capable of handling four concurrent calls, we suspect high traffic locations (or homes) might potentially risk losing the benefit of cheaper fixed calls if too many "roaming" handsets are trying to use the AP at once, unless the "home" AP is capable of prioritizing the signal of the primary user (which we would expect to be the case). These and a number of other questions remain, but nevertheless, we think this looks like an interesting outreach technology for the fixed network, while offering a unique selling point to the conventional MVNO business, which is a key issue in this market. We need to go away to a quiet room sometime soon to try to have a crack at what the revenue opportunity might for this product, but BT is targeting GBP1bn in annual revenues from mobility in five years' time, and we think a unique product set such as this underlies a lot of that growth assumption. Just for reference, the last official data from defunct regulator OFTEL, from Q2 2003, showed mobile market revenues of GBP2.6bn for the quarter, of which 83% related to voice. We think BT's five-year target revenues equate to a 5% revenue share of the market, which we do not believe to be too aggressive. BT currently counts 113,000 business connections on its MVNO, and the consumer side has 60,000 users since launching last October, adding 15,000 per month. This makes it significantly smaller than Virgin Mobile, which added 257k subs in Q1, for 3.9m users overall, but the target markets are entirely different. We think we may see net adds to BT's service increase significantly as Bluephone is introduced, and it will be interesting to see how the marketing message is delivered. The obvious appeal is "why pay outrageous fees for calls over your mobile phone when you're in your own home?" but there may be sensitivities around that message. It will also be interesting to see how other operators, especially Vodafone, react in their marketing and product development to the arrival of a product which has clear deflationary implications for mobile market pricing, if it takes off. It has been interesting over the past few quarters to see the stimulus to the broadband market coming from the introduction of lower-cost, lower-speed DSL products in certain European markets. This was particularly graphic in the KPN (rating 4 - UNDERPERFORM) Q1 results on Monday, where the new EUR25/month 384kbps product accounted for 63% of the very strong net adds number. It was interesting to see the apparent churn from higher cost, faster products, and also to see a 0.5% contraction in the ISDN line count. We can only speculate as to what role if any, the cheaper DSL products played in this decline in ISDN, but it is nevertheless interesting to observe a decline in ISDN coinciding with the arrival of DSL priced at a level only 15% higher than that of ISDN. In our results note on Swisscom (rating 4 - UNDERPERFORM) from Wednesday, we made a vague allusion to an interesting product pipeline from Cablecom, and here's the first example, released last month. The hispeed 100 (http://www.cablecom.ch/en/internet/hispeed/bundle.htm) is a bundle of a 100kbps cable modem service with IP telephone service, for a total cost of CHF50 ($38) per month, and is aimed directly at the ISDN market. The company's estimate of combined monthly access and call charges for a typical ISDN customer is CHF70 (CHF43 for access and CHF27 for calls), suggesting that the Cablecom bundle can save consumers CHF20 per month. As with its previously-launched VoIP product (which now has over 27,000 users), national calls are at a flat rate of CHF0.03 per minute at all times (per second billing, versus Swisscom which uses minute rounding), with the usual discounts on international calls. The ISDN base of Swisscom (and many other European operators) has been remarkably stable, adding 1,000 lines in Q1, for a total of 925,000, or 23% of Swisscom's total line base. Plugging in the ARPU which Cablecom ascribes to ISDN subscribers suggests quarterly run-rate revenues of CHF194m currently for Swisscom (equivalent to 17% of the reported external revenue of the fixed line division in Q1), at what we believe to be a very healthy margin. We plan to monitor the development of the Cablecom product closely, as we think this could see imitation in some markets with high cable penetration, vigorous growth at the low end of the broadband market, and a large and stable installed ISDN base (the Netherlands springs to mind). We think the attractions are numerous for the cable player - displace a large chunk of an entrenched user base from your competitor, bundle the phone to get it into the hands of the new user, and set the pricing of your higher speed products to promote migration. Cablecom's 500k product is only CHF45 per month - adding an IP phone line at CHF20 still leaves the product cheaper than ISDN. 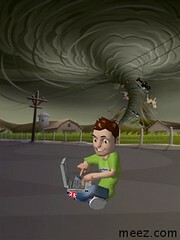 ><><><><><><><><><><><><><><><><><><><><><><><><>< PCCW announced its soft launch of wireless broadband services in the UK today. Overall, we believe the plan is largely in line with what management told us in early March in its 2003 annual results briefing. Initially, we believe that the service quality and pricing to be offered by PCCW sound competitive. However, we incline not to understate the execution risk of the project given the company's limited overseas (ex-China) experience. Additionally, we believe that it remains to be seen whether the technology will be well-received by customers as it seems to be still quite new to the market. Our current rating on PCCW is 4 [UNDERPERFORM] due mainly to its demanding valuations. In summary, six areas in the Thames Valley, including Aldershot, Maidenhead, Reading, Slough, Windsor and Wokingham, will be the first places to launch the services. PCCW will continue to soft launch the services this month, targeting coverage of 300,000 households. In the press conference call it held in the afternoon (HK Time), management cited that the roll out areas are specifically chosen so as to make sure that it can achieve the market share it targets. It also expected to announce the nationwide launch plan in August after it received a better indication of the market from the soft launch. The company will initially target the residential market. Two services will be offered: (1) 512Kbps for a monthly fee of GBP18 and (2) 1Mbps for a monthly fee of GBP28. Management believes that the service is very attractively priced. British Telecom charges its broadband services at GBP20-30 per month for 512kbps and GBP38-41 per month for 1Mbps services. Besides, management also said it will offer 24 hour delivery for the serivces, call center services 7-day a week and engineer support (can go to the customer site the next day) and look to change the nature and quality of services in the UK. There will be two vendors for the services, IP Wireless and Navini, with IP Wireless as the major supplier. PCCW will test two different technologies in the soft launch (one allows soft handoff and one does not). PCCW has spent US$35-40m on opex and capex for the soft launch and there will be 30 base stations at the end of soft launch. It declined to disclose the financial requirement for a nationwide launch as it will largely depend on the launch plan to be finalised after the soft launch. Management targets a 10-15% market share over a number of years and looks for cash flow positive within 2006 or at the latest early 2007. ><><><><><><><><><><><><><><><><><><><><><><><><><>(http://www.flarion.com/viewpoint/reports/SignalsAhead0404.pdf). This is a particularly interesting example, as the service, theoretically for the mobile data environment, sounds fully able to function as a viable alternative to wired residential broadband (average data rate of 1.5Mbps, latency of 35ms, which is more than adequate for VoIP). In other words, we may have the first example of a major cellular player entering a previously untapped segment of the market. Exciting stuff. (Just a moment ago we received a press release from Flarion confirming the reporting on Reuters this morning, that Vodafone will test Flarion equipment in Tokyo from mid-2004.) Now PCCW jumps into the increasingly complicated UK market, diving in at the deep end, in the Thames Valley area of the UK, something of a hi-tech corridor with potentially very discerning customers. The area also includes Telewest's cable footprint. Nevertheless, the pricing looks attractive relative to either of the incumbent providers (Telewest's 1Mbps offering costs GBP35 when taking another Telewest service, GBP37.99 as a standalone). We will continue to track this story, and the entire theme, as it evolves, as we think it is yet another potential source of the market fragmentation we have been monitoring. talktalk channel check - weekly net adds continue to rise? At lunchtime today I stopped in at the Carphone Warehouse store on Cheapside, the beating heart of the City of London (just around the corner from BT Centre), ostensibly to buy a replacement for the execrable DECT phone which broke two weeks ago, leaving my household as "mobile-only" converts (and the longer it continues, the less I miss the PSTN). In any event, while attempting to find a model which was both attractive enough not to offend the eye, but durable enough to withstand repeated assaults from an 18-month-old, I made small talk with the staff. In response to my queries, they indicated that they are currently signing up roughly 30 new customers to the talktalk (http://www.carphonewarehouse.com/commerce/servlet/gben-server-PageServer?ARTICLE=STATIC.TALKTALK) carrier pre-select plan every week. (As we've mentioned previously, talktalk is interesting to us in this context because its creators seem to have taken a few pages out of the SIP service providers' strategy book: viral marketing and free on-net calls, which we think will eventually be extended across the company's 11-country European footprint.) Now, the Cheapside branch is probably something of a flagship location for Carphone Warehouse, so we would hesitate to say with confidence that every location is seeing as much traffic. However, if that rate were to be applied to all 475 UK stores, we would be talking about a weekly net add rate of 14,250, through the direct channel alone (talktalk is also available via the website). At the end of Q1, Carphone Warehouse reported 385,000 talktalk subscribers, which we calculated to equal a weekly run-rate for net adds of 11,231 (up 49% on the previous quarter). One store visit doesn't equal a forecast, we know, but it is interesting to hear news like this from the field, particularly in light of reports in UK paper The Business last weekend that BT Group may be seeing a net loss of up to 100k subscribers per month, principally to CPS offerings. The other key player in this area, Tele2, is still refusing to divulge subscriber numbers. The Business article speculated that the gross loss to CPS players (before returning cable customers) could be between 150 - 200k per month. We will be looking for any signs of pressure when BT reports on 20th May. Daiwa Securities SMBC Europe Ltd.